Are there any studies on the use of justified text in web apps? How does justification affect screen legibility? Browsers are not very good at handling justification and displaying justified text, and one is likely to be presented with text where the spaces between words varies a lot, unlike the more subtle variation in spacing that is achieved in printed text. This extreme variation in the spacing makes the text more difficult to read - instead of the eye being able to move smoothly along the line of text, it has to move in "fits and starts", searching for and jumping to the start of each word. While someone with no sight problems or reading difficulties might find this no more than a mild aggravation, it can present real problems to anyone using screen magnification software (since the gaps between words are also magnified), and to people with conditions such as dyslexia. Some people with reading difficulties and/or some cognitive disabilities find that the "rivers" of white space which can easily occur within justified passages of text on screen form a more distinct pattern than the actual words themselves, making the text extremely difficult to read and comprehend. There are some important points that appear to have been completely overlooked. You don't have to choose (enable your readers instead). It may be worth remembering that the use of justified text goes back a long way. Justified text is used in probably the most highly regarded and most valuable documents that exist. It is only a failure of web typography that some web-browsers are unable to render justified text that does not contain defects like rivers. These were not a problem five-hundred or a thousand years ago. 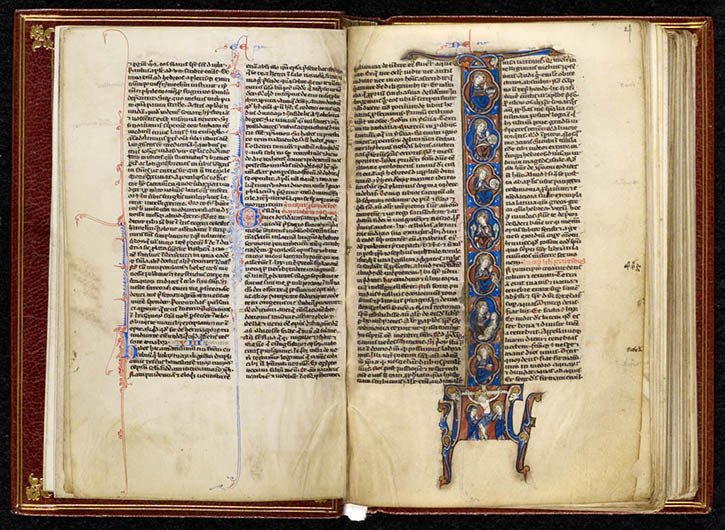 13th Century English bible in Latin. Library of congress. Handwritten. Note the absence of gross defects such as rivers. 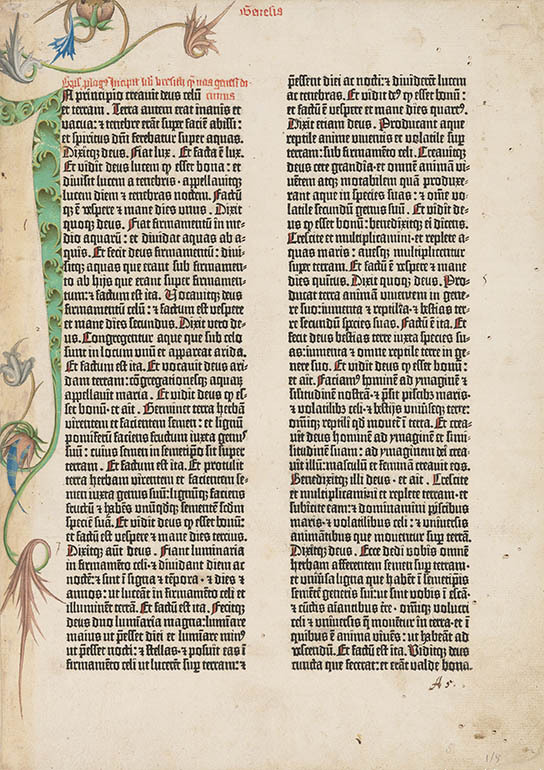 Now of course these are not easy to read, but the main reasons for this difficulty are not to do with the justification of the text, of more significance is the use of Latin and the use of a now unfamiliar black-letter typeface. So whether to use justified text depends partly on whether you want to produce something beautiful or something mundane and ordinary. You shouldn't be asking this question at all. You don't have to choose. You can offer the reader a choice or a range of choices. This is all about CSS style sheets, not about HTML content. The whole point of CSS is to solve this problem for you. It is a comparatively simple matter to offer the reader a choice of visual styles that are remembered using a cookie. One of the stylesheets on offer can be optimised for dyslexics, another for those with impaired vision, another for those with red-green colour-blindness and so on if you wish (or feel is needed). You absolutely do not need to impair or degrade your website so that it cannot be enjoyed by those who appreciate good typography. I'm, at best, a mediocre web designer. However I thought I'd better test my assertion that justified text need not create the ugly rivers that cause problems with readability. I created a small basic test page. It seems to work about as well as I would expect in the current browsers I have available. Not the answer you're looking for? Browse other questions tagged text alignment legibility or ask your own question. Best way to align text on a website? What name is this text effect known by? How much text markup is good, before it becomes bad? How should I format question-response sections in a document?